A life-and-death drama played out on the field before Thursday night’s game at Dodger Stadium between the Dodgers and the San Diego Padres. 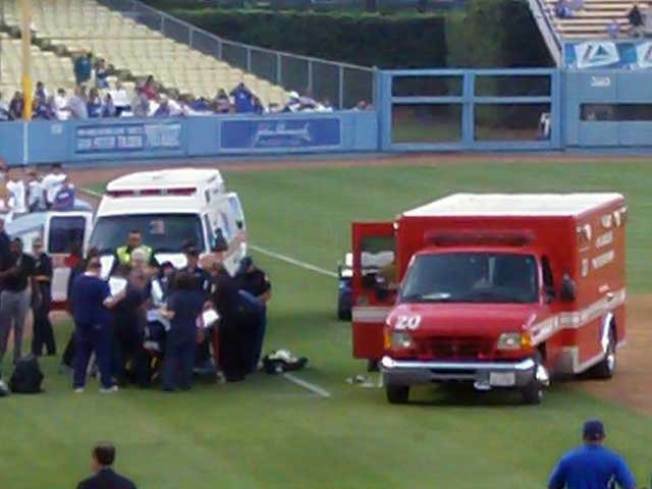 A VIP guest invited to take part in pregame first pitch ceremonies on “Mormon Community Night” collapsed on the field in front of the Dodgers’ third base dugout. At about 9:30 p.m. a Dodger spokesman told NBCLA the person who was treated on the field was pronounced dead at the hospital. Members of L.A.F.D’s Station 20, including paramedics, were also on hand to be honored in a pregame ceremony. Fans watched as the firefighters went into action and administered CPR to the man, identified as Don Hawkins. An ambulance was driven onto the field and the victim was taken to the hospital.